Navagraha Homam - Group Fire Lab(Ritual) for All 9 Planets ! The Aim of performing Navagraha Homam is to remove all the Stumbling blocks/hurdlesin person life to attain Ayur-Life, Arogya-Health and Iswaryam-Wealth. Navagraha's are 9 planets - Surya(Sun), Chandra(Moon), Mangala(Mars), Budha(Mercury), Guru(Jupiter), Shukra(Venus), Shani(Saturn), Rahu(North Lunar Node) and Ketu(South Lunar Node) which are plays a major role in deciding the destiny of the person . The nine grahas or planets in our horoscope control our Good & Bad, karma, our desires and their outcomes. Each of the nine planets influence in our lives, which is called "dasa? and its can be known from our horoscope. Bad times are attributed to the different Grahas (Planets) and their position in our natal chart. The Grahas can be appeased by performing the Navagraha homam and remove Doshas or reduce malefic effects. The blessings of the Navagraham can be obtained even if they were placed in wrongpositions in the horoscope. Navagraha Homa is more powerful than any other homas because you are performing for nine planets. It is a remedy for all doshas. Conducting this homa reduce the negative effects and stimulate positive energies related to a person. This homam is done to worship the 9 planets i.e. The Sun, The Moon, The Mars, The Mercury, The Jupiter, The Venus, The Saturn, The Rahu & The Ketu. Every planet has its own importance. Kethu lead prospers the family. Negative effects will be minimized. Weak planets are strengthened. Disciplined mind, Peace of mind. Quickness in action and result. Navagraha Homa is combined homa for all the nine planets and is divided into nine parts. 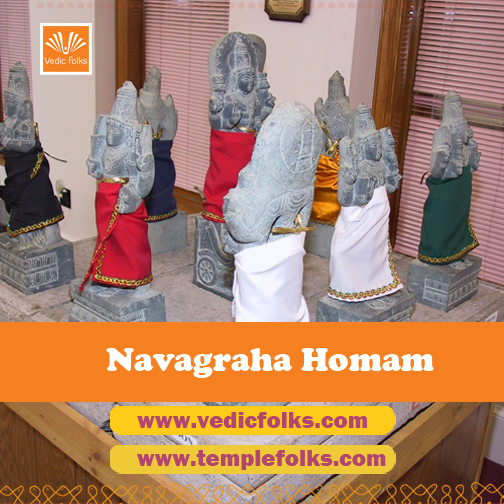 The Homam is performed after conducting a Navagraha Pooja and nine varieties of flowers, nine cereals (Nava Dhanya), nine vastrams (fabric of different colors), and nine types of Naivedyams are used for the pooja. Each Graha is worshipped with a specific flower. Nine types of Chamatas (twigs) are used. Vedicfolks Experts Pandith or Bramana?s who has that much knowledge and experience can only perform this yagya. This homam has the power to counter flaws in the horoscope and enable a person to prosper in life in case astrological defects are the main blocks to well-being. The homam Fire lab is done to appease the nine planets i.e. the Sun, Moon, Mars, Mercury, Jupiter, Venus, Saturn, Rahu, and Ketu and is considered to be an effective remedy for Navagraha Dosha. Participate Now - We accept 4 name Sankalpam for single Order!